A wise and witty exploration of one of the single greatest challenges facing every child — the formation of self-identity. “Become such as you are, having learned what that is,” counseled the Ancient Greek poet Pindar. The advice concerns one of life’s greatest challenges: the search for self-identity and the struggle to become an independent individual. Younger readers who have difficulty comprehending abstract philosophical concepts will appreciate Thunder Boy Jr. (public library), a children’s book that provides a practical and pictorial spin on Pindar’s sage advice. 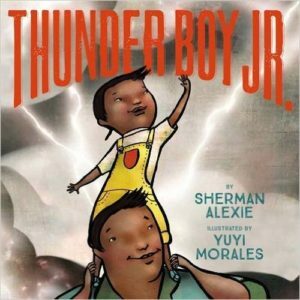 Alexie’s first picture book, Thunder Boy Jr. examines the issues surrounding self-identity from the perspective of a young boy (“Thunder Boy Jr.”) who, like the author, is named after his father (“Thunder Boy Sr.”). 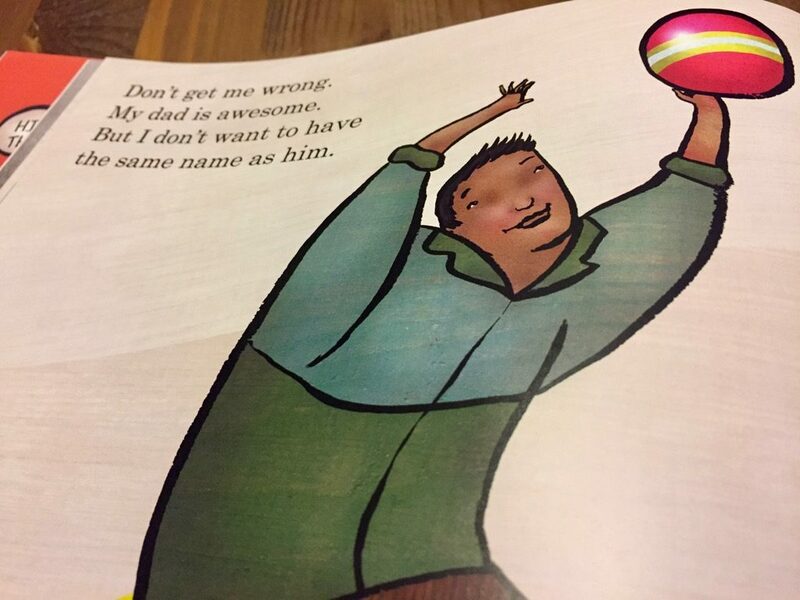 Thunder Boy Jr. loves his father, but he recognizes that he is an altogether different person, and he daydreams about having a different name and separate identity. Hello, my name is Thunder Boy. Thunder Boy Smith. That’s my real name. My dad gave it to me at birth. My mom wanted to name me Sam. Sam is a good name. Sam is a normal name. Thunder Boy is not a normal name. There is nobody on earth with the same name as me. I am the only Thunder Boy who has ever lived. Or so you would think. But I am named after my dad. He is Thunder Boy Smith Sr., and I am Thunder Boy Jr.
As a Native American who grew up on the Spokane Indian Reservation in Washington State, Alexie was always interested in creating a book with strong Native American characters. 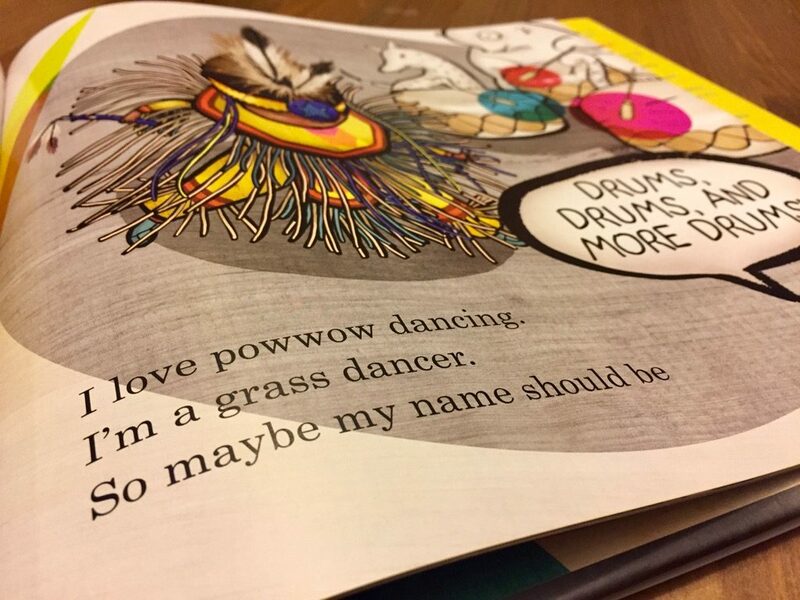 With beautiful artwork reflective of Native American culture, the book is a colorful celebration of a culture foreign to many Americans. 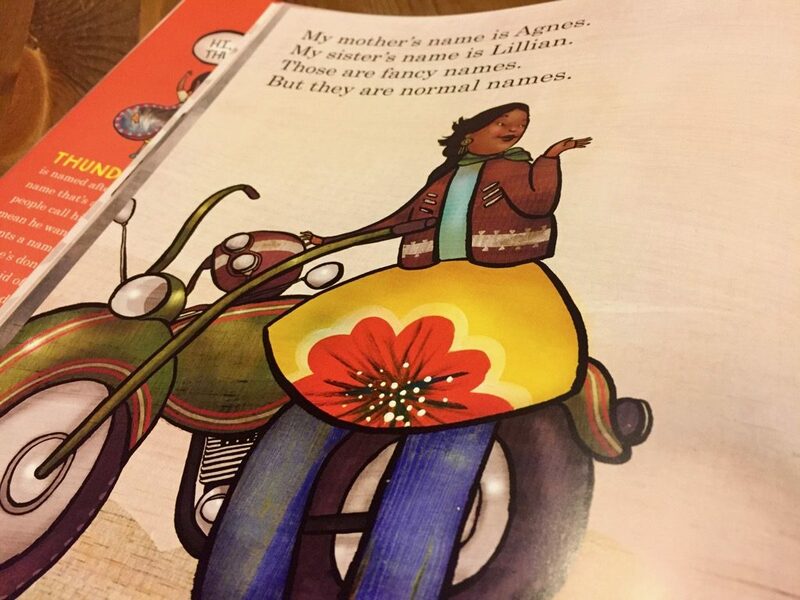 The front matter provides details on how Yuyi Morales created the illustrations. 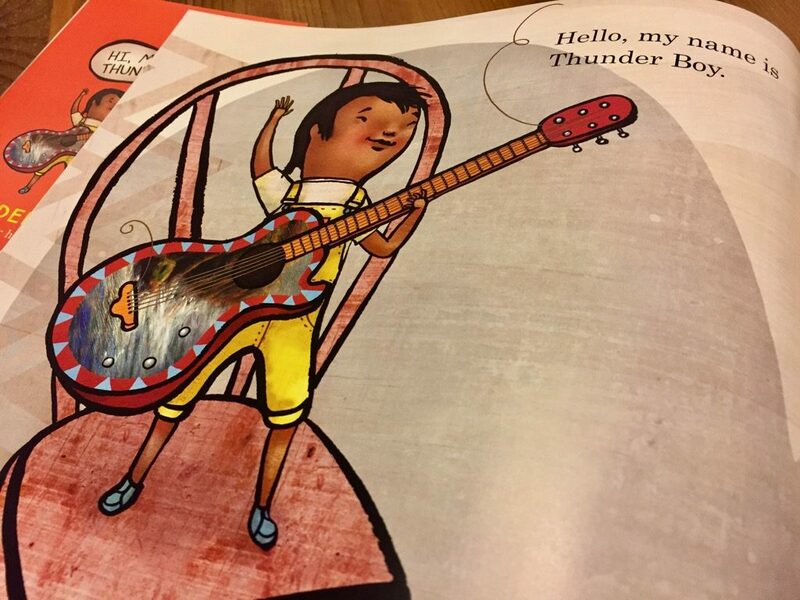 The illustrations for Thunder Boy Jr. were made from the remains of an antique house in Xalapa, Mexico, where Yuyi now has her studio and where she created this book. When the rotting roof and some of the walls came down, she picked out old wood as well as clay bricks that she later scanned and used their colors and textures to digitally paint the illustrations. Thunder Boy Jr. daydreams and experiments with a number of fictional names for himself. At the end of the story, Thunder Boy’s wish is granted. He gets a new name, and he takes an important step in the journey to discovering the person he is. My dad read my mind! My dad read my heart! For adult readers, Thunder Boy Jr. serves as a tender reminder of the daily self-identity challenges faced by our children. Most of us have overwhelmingly fond memories of childhood. When seen from the comfortable vantage point of adulthood, our younger years were filled with unbridled discovery, reckless play, limitless excitement, first love, and courageous acts of bravery. But if we’re being honest, that’s only the half of it. Childhood is also full of daunting challenges, humiliating mistakes, and crushing failures. By any measure, growing up is an arduous process. It’s fraught with innumerable trials and tribulations that — once surmounted — add up to maturity and adulthood. The formation of self-identity is one of the greatest challenges facing every child — a challenge that typically persists long into adulthood. Phrased as a question, the challenge is this: Who are you, and what is it that makes you different and unique from everyone else? 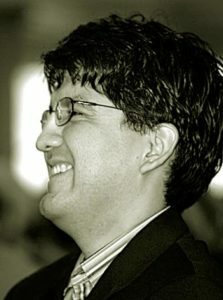 To become whole, children need to develop their own unique identities — those which differentiate them from parents, teachers, and other individuals. In so doing, children effectively stake out their place in the world. They lay claim to the personality traits and characteristics that make them genuinely unique. They embrace the talents and virtues with which they have been born. They discover the path to themselves and start blossoming into mature adults. Thunder Boy Jr. acknowledges and celebrates this process of self-discovery. 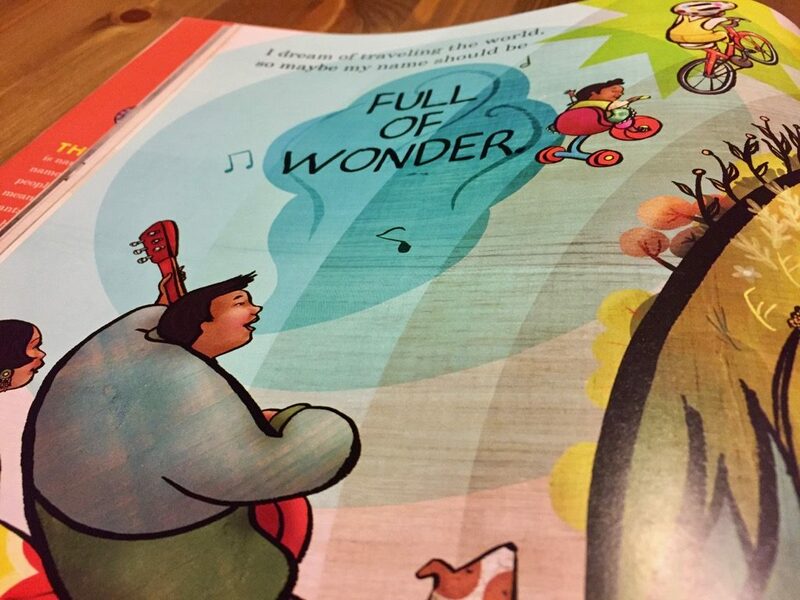 Children and adults alike will discover that they can learn a lot from this beautiful book. 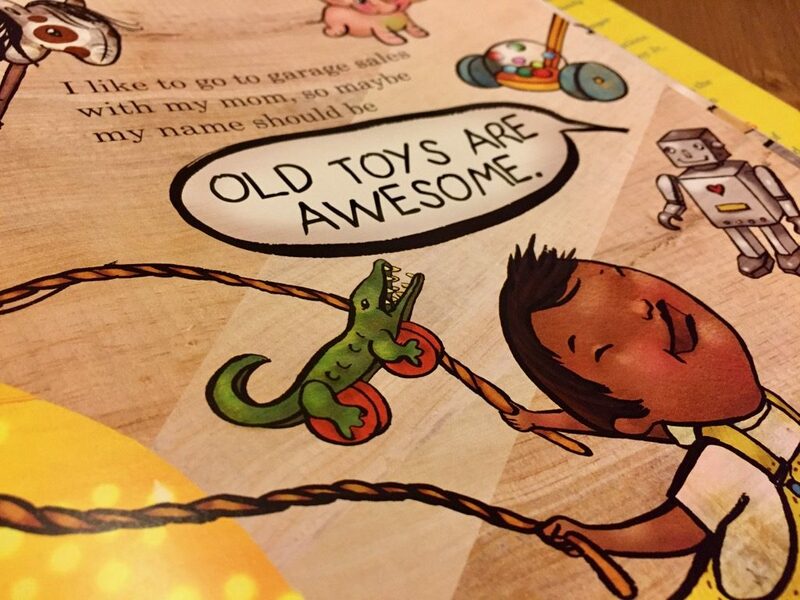 Complement with Trombone Shorty and Those Shoes, two other books with important life lessons featuring diverse characters.